As this map illustrates, a significant portion of Idaho’s Snake River Plain contains geothermal resources, some of which flows beneath Boise’s Treasure Valley. Photo Credit: The United States Geological Survey. Since the late 19th century, Boise’s geothermal energy has been an economic and cultural driver of the city’s development. Entrepreneurs capitalized on the region’s active geologic inheritance to provide Boiseans with cheap, sustainable energy long before the environmental movement of the 1970s popularized the “green energy” concept. 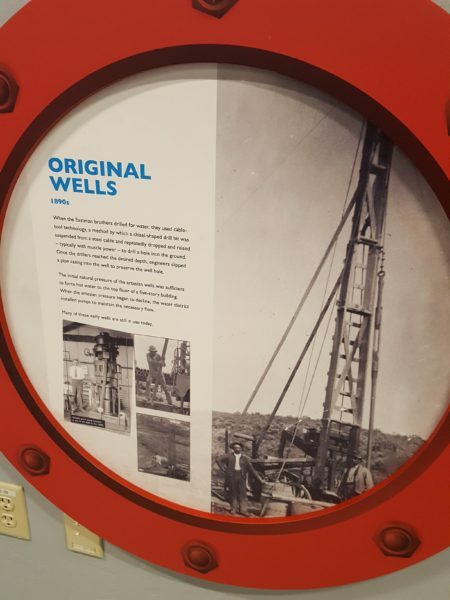 In 1890 and 1891, the Boise Water Works Company pioneered the municipal-scale use of geothermal water when it completed two geothermal wells along the east Boise Front, which brought geothermally heated water to the surface. The Boise Water Works Company later consolidated with another local water company to form the Boise Artesian and Hot and Cold Water Company. The geothermal water, naturally emerging from the ground at approximately 165-170 degrees Fahrenheit, provided heat for residences along the area’s Warm Springs Avenue and for downtown businesses. It also provided hot water for Boise’s iconic indoor spa – the Natatorium. This geothermal corridor eventually became known as the Boise Warm Springs Water district and is the oldest continuously utilized geothermal system in the United States. Drilled in 1890, two wells brought the first naturally heated water to the surface in east Boise. The initial pressure of the artesian wells was sufficient to force the hot water to the top floor of a five-story building. Photo Credit. Boise WaterShed Exhibits, Inc. Photo Date, 2018. The original Boise Artesian Hot and Cold Water Company pumphouse still operates today and is listed on the National Register of Historic Places. The pumphouse is significant because it was “built to accommodate Idaho’s pioneer application of a natural hot water heating system.” The original geothermal district provided the blueprint for the future expansion of geothermal heating systems in Boise as well as commercial geothermal systems in countries throughout the world including Italy, New Zealand, Iceland, Mexico, Japan, and even Russia. 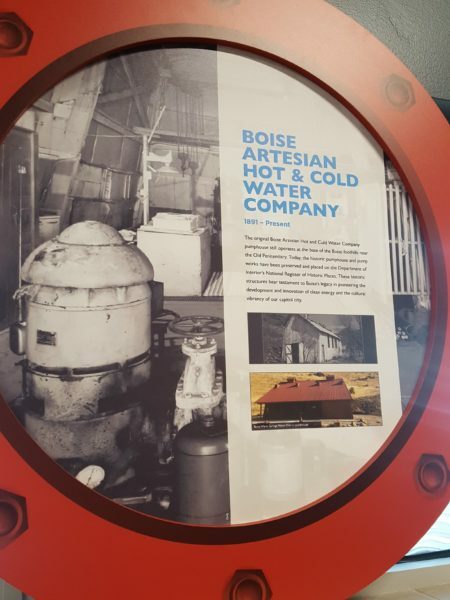 In 1891, two competing water interests consolidated to form the Boise Artesian Hot and Cold Water Company, which pioneered the development and innovation of inexpensive-clean energy in the Treasure Valley. In doing so, the company set a precedent for other geothermal heating systems that soon followed. Photo Credit: Boise WaterShed Exhibits Inc. Photo Date, 2018. During the 1970s energy crisis, interest in Boise’s geothermal potential intensified and the State of Idaho collaborated with Boise State University to map the Snake River Plain’s undeveloped geothermal resources. As a result, Boise boasts four such geothermal districts: the Boise Warm Springs Water District, the State of Idaho, the Veterans Administration, and the City of Boise. In 2017, the City of Boise expanded its geothermal heating district when it added the Central Addition, Boise’s first sustainable neighborhood. The City of Boise prides itself on its stewardship of this precious resource. To that end, the City of Boise has collaborated with Boise Watershed Exhibits, Inc. (BWE) to promote water stewardship through a variety of interactive exhibits. These exhibits are displayed at the Boise WaterShed Environmental Education Center, located at the West Boise Wastewater Treatment Plant. The facility also contains the Boise WaterShed River Campus, a series of outdoor exhibits that model the Boise watershed and the city’s effort to develop a sustainable future in the wider Treasure Valley where Boise is situated. 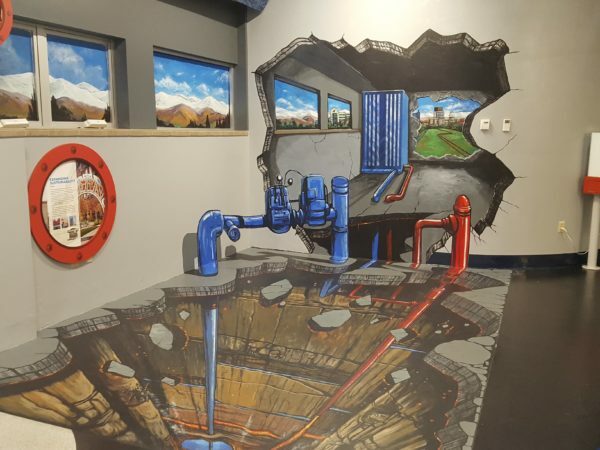 Boise WaterShed Exhibits, Inc. educates the public on water conservation through interactive exhibits and hands-on-programs such as “The Heat Beneath Your Feet.” Photo Credit: Boise WaterShed Exhibits, Inc. Photo Date, 2018. During the summer of 2017, Boise Watershed Exhibits, Inc. contracted with Stevens Historical Research Associates (SHRA) to investigate Boise’s unique geothermal history. As part of the engagement, SHRA developed a historic photographic timeline for BWE’s newest exhibit, “The Heat Beneath Your Feet,” that displays how the city pioneered the development of the nation’s first geothermally heated residential district and the expansion of geothermal use throughout the city. 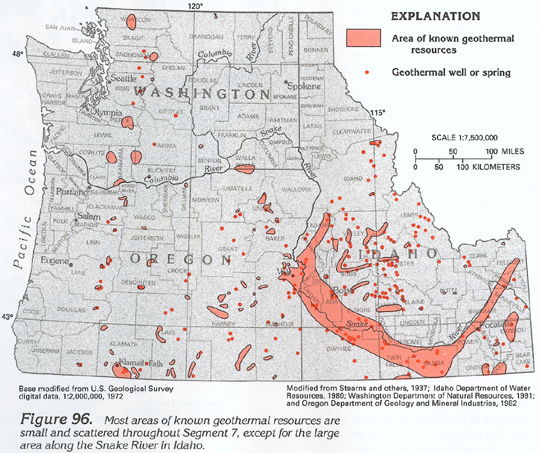 Through extensive archival research at the Idaho State Historical Society and Boise State University’s Special Collections, SHRA revealed how Boise’s geothermal past has played an important role in securing the city’s “energy future” – SHRA brought Boise’s geothermal past forward. During the summer of 2017, Stevens Historical Research Associates (SHRA) performed extensive research at state and local archives to uncover Boise’s geothermal history. 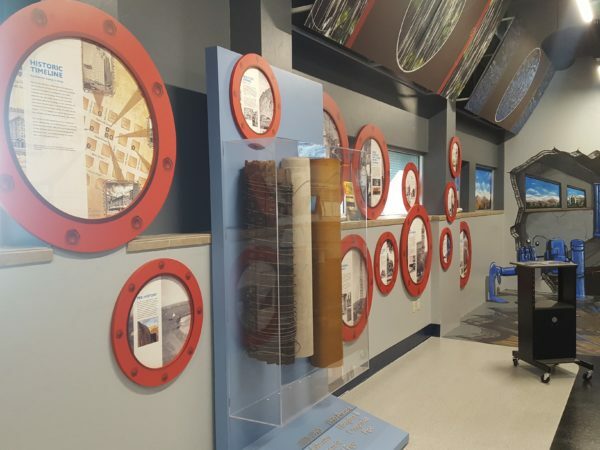 In collaboration with Boise WaterShed Exhibits, Inc., SHRA created a captivating timeline of the city’s relationship with geothermal water, which it captured with an historic timeline on display at BWE’s Boise’s WaterShed River Campus in west Boise. Photo Credit. Boise WaterShed Exhibits, Inc. Photo Date, 2018. 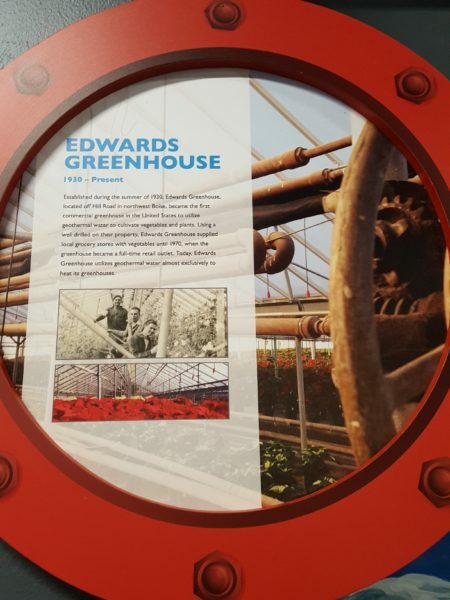 Like Boise Artesian Hot and Cold Water Company, Edwards Greenhouse pioneered the use of geothermal water when it became the first commercial greenhouse to use the resource to cultivate vegetables and eventually flowers in the Treasure Valley. Photo Credit: Boise WaterShed Exhibits, Inc. Photo Date, 2018. Boise WaterShed Exhibits, Inc., “The Heat Beneath Your Feet,” https://boisewatershedexhibits.org/boise-watershed-river-campus/exhibits-in-the-works/, accessed December 29, 2017. Merle Wells, “Artesian Hot and Cold Water Company Pumphouse and Wells,” National Register of Historic Places Inventory-Nomination Form. (United States Department of the Interior, National Park Service, Boise, Idaho): June 21, 1979, page 8.